To me Coq Au Vin is the epitome of classic French cuisine – and now I find I can make a low-carb version and enjoy it just as much. It’s sorta like when you use the holy trinity of French cooking – if you use fresh, good quality ingredients, you have some leeway on making it work for your eating plan. If you look at the true translation of Coq Au Vin, it means “rooster in red wine”, hence the use of Red Burgundy in a typical recipe for this dish. I made Coq Au Vin the correct way for years, but half the time my sauce would turn the color of purple and even the chicken would have a purple tinge to it. Mind you it still tasted terrific, but I found it hard to get past my chicken resembling Barney. So I changed it up a bit and started using white burgundy instead (chardonnay or Chablis) – it both tastes good and looks appetizing as well. In keeping with a low-carb version I eliminated all use of flour and used egg yolks to thicken the sauce instead – which you will see under Method. If you don’t want to use egg yolks, make a slurry from cornstarch (but you will need to up the carbo count by 1 carb per serving). And I think there ought to an aroma feature on food blogs, as when you make this dish your house smells amazing. Am going to remember this when I go to sell my house – will have this on a low simmer on my stove top – I think it would be better than cookies baking in the oven! 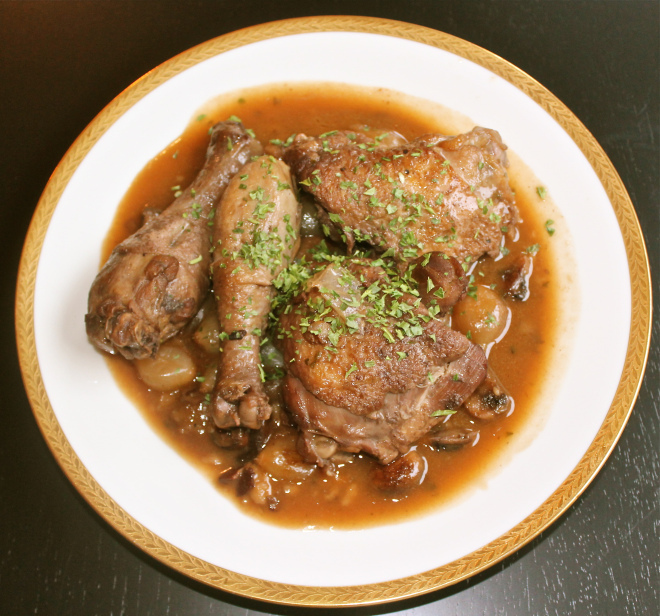 As to low carb and Coq Au Vin: 6.5 carbohydrates per serving (original recipe has 17 carbs). Remember the chicken itself is zero carbs, so you may have some leeway on a 2nd serving, which means increasing the carb count, but likely not having to double it – just sayin’. A little pancetta, a little sliced onion, a little butter – delish (am hungry already). Brown the chicken in batches and lay them right on top of the pancetta and onion – added a slight swirl of olive oil to the pan to help brown the chicken. 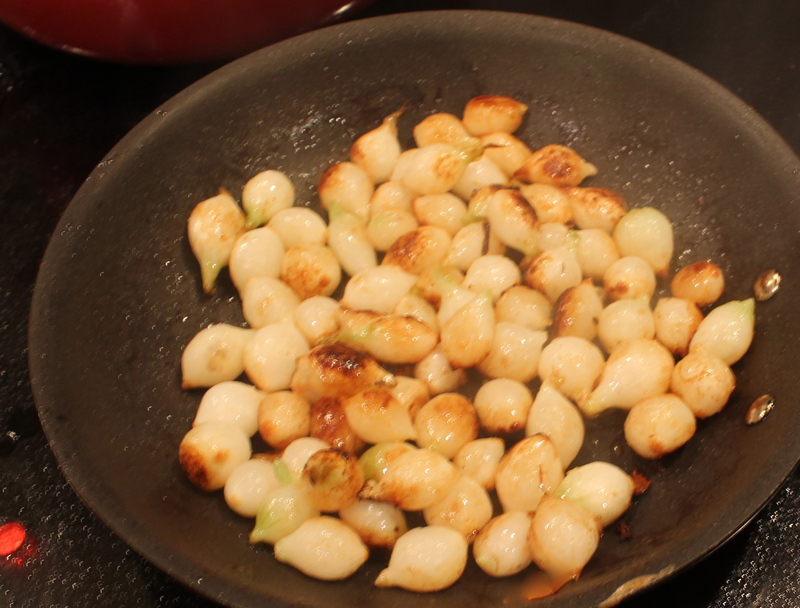 While the chicken is cooking, saute the pearl onions in butter till they turn a light brown color. Chicken is ready to be drenched with burgundy, chicken broth, and of course, the Courvoisier! Here’s where “Select Aroma Button” for a food blog would come in handy! 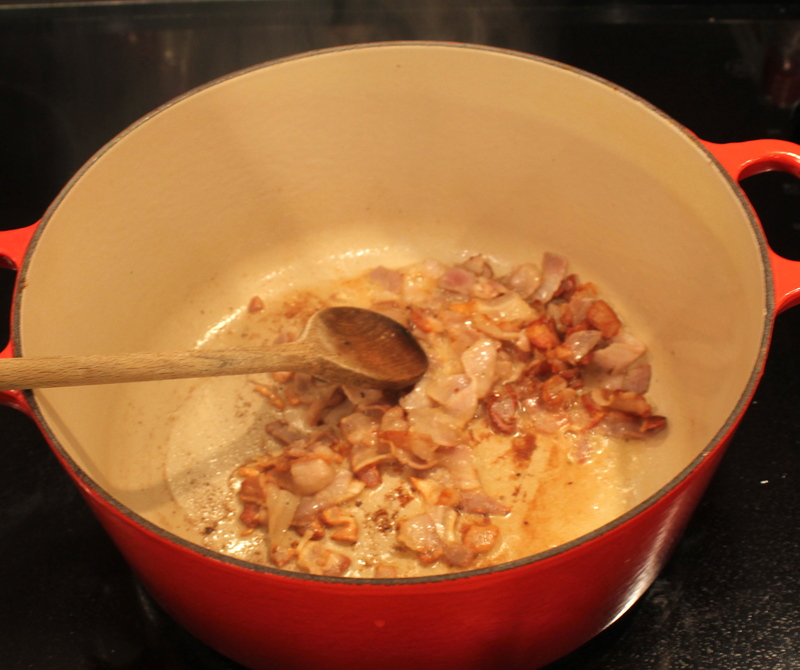 Slice the yellow onion, chop the pancetta, and clean and quarter the mushrooms. 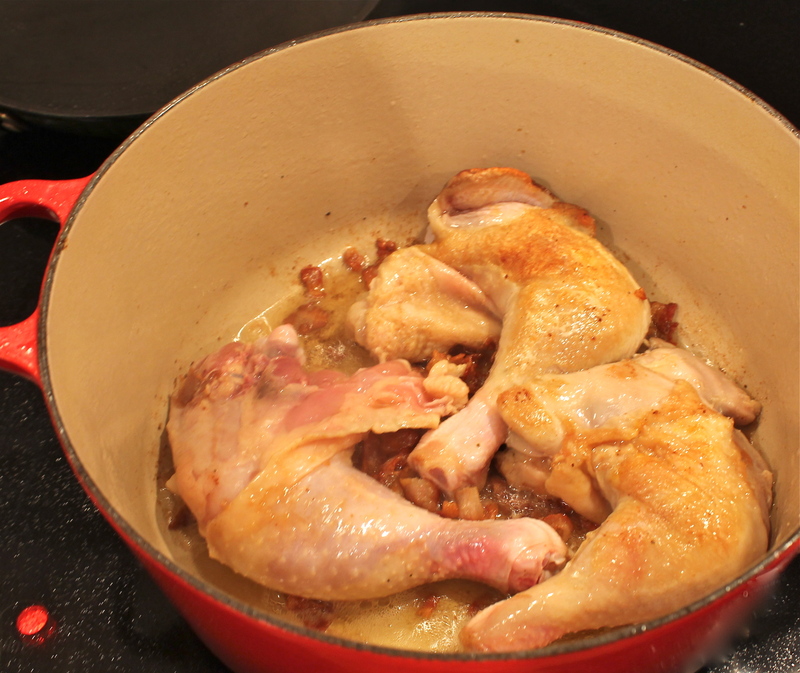 Using a Dutch oven, add olive oil and the pancetta and cook till lightly brown (about 8 to 10 minutes). When done remove pancetta with slotted spoon and set aside. Cut the chicken into 8 portions, clean it using cold water, and pat it dry with paper towels (if you don’t dry it, it won’t brown). Add a bit of butter and olive oil and brown the chicken in batches and set aside. Add onion slices and salt to the pan and cook the onions over medium heat for about 10 minutes till lightly browned – mid-way toss in the garlic, but watch it carefully so it doesn’t burn (burn equals bitter garlic). Add the wine and deglaze the pan, scraping the bottom and sides with a wooden spoon. Let it bubble up, then add the chicken, chicken stock, Cognac, thyme, mushrooms, and add back in the pancetta. Let it come to a boil and then turn down to medium low heat, cover and let cook for 45 minutes. While the chicken is cooking, remove frozen onions and toss into a pan with a Tbl of butter – cook till lightly browned. Add to the chicken. At the 45 minute mark, take the two egg yolks and beat them till creamy – add a tablespoon or two of the sauce to yolks (this is called tempering) and whisk briskly till blended. Add the mixture back to the sauce, and whisk until smooth. Heat the mixture just until it boils and turn down to lowest temperature and let it simmer until sauce thickens – this is about a minute or two. Whatever you do, don’t just throw in the egg yolks into the sauce or you will have “Chicken and Scrambled Eggs” in about 20 seconds. Finishing cooking the Coq Au Vin for about another 10 minutes and it is ready to serve. I served mine with asparagus. I know the aroma well, coq au vin is one of my favorites. Your adaptation is wonderful. Had to laugh when you said you would make this if you are ever going to sell your house, I am in real estate and had a house in my neighborhood for sale, the owner made coq au vin while I was doing an open house and everyone was so in love with the smell, the house sold at that open house! Another time the owner baked bread, the house sold. There is a lot to be said for enticing aroma. I know! It’s amazing how lovely aromas in the kitchen can help sway a buyer that this is the house for them – usually conjures up great family times in the kitchen! I’ve often thought it’d be good to have an “aroma” feature on the blogs as well 🙂 Your coq au vin looks amazing. You are eating very well! And love that it’s all in the name of being healthy. Thanks Liz – yes, trying to keep it healthy but still tasty. 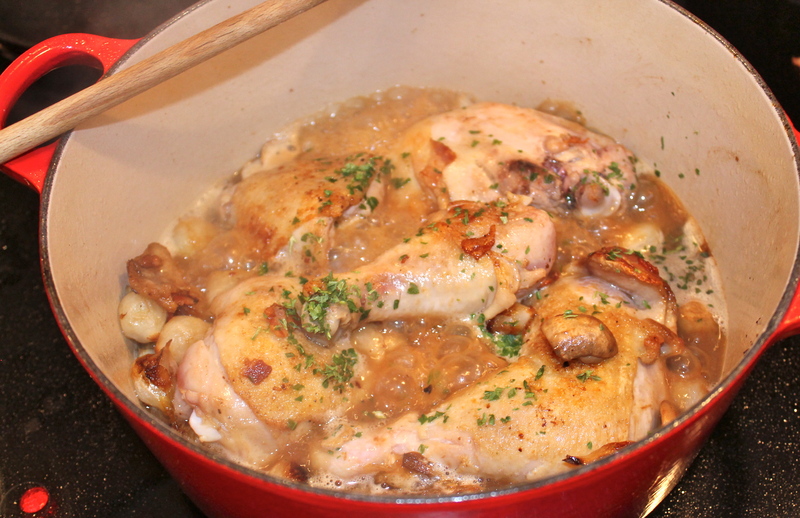 Coq au vin is a favorite and you’ve done a wonderful job cutting the carbs on this dish without cutting the flavor. I made this dish for my family this weekend. It was delicious! We loved it! All of us kept saying mmmm during the meal. 🙂 This recipe is definitely a keeper! Thanks so much Sheila for writing and letting me know. Glad your family liked it!! This is one of my favourite meals. Thank you for sharing this great recipe and the beautiful pictures.